It's not really summer until you've played with water balloons. I found the neatest gadget for making water balloons. 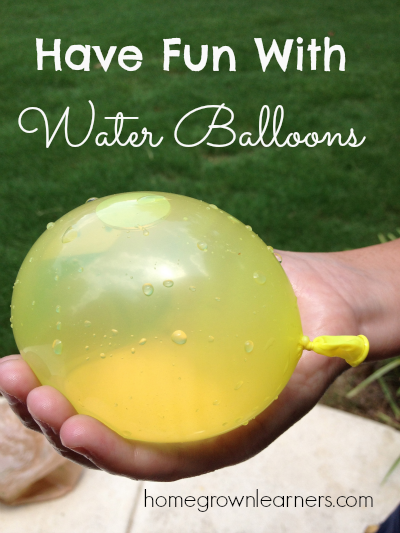 I know -- you don't really need a gadget for water balloons. Just put your balloon on the spigot or faucet and fill it up with water - then tie, right? Well, this always seems to be a hassle in my house, and I end up doing all of the water balloon work. Plus, as my friend Jen told me, I earned major mom points by bringing this fun thing home! He then went outside to have fun. So - what can you do with water balloons? A simple game of catch is fun when you up the stakes with a water balloon. How many tosses can you make before your balloon breaks? You can play this with a friend or alone - if you're playing alone just toss the ball in the air and catch it. Grant took two buckets and filled them with water. He spent loads of time experimenting with how the balloons floated, how the water level would rise when he put a balloon in, and much more. Unstructured play is something our children are lacking, and I was so pleased to see him just experimenting on his own. I have a numbers guy on my hands. He needed to make sure we had equal numbers of balloons in all of the colors. Using that same bucket of water, he made a game out of tossing the balloons into the water. He marked places on the sidewalk with chalk and would see how far he could move away from the bucket and still get the balloon in. Can a Water Balloon Survive Flames? Have you seen this water balloon science experiment? We tried it, and it WORKS! Anything can be your target, but for some reason my van was the funniest thing. He got a huge kick out of throwing the balloons at it and watching them splat on the driveaway. Go figure. My children's swimming teacher always had water balloons on hand. As they jumped from the diving board she would throw them a balloon to catch. If they didn't catch it, it didn't pop, and they could retrieve the balloon so they could try again. I have no pictures of this, but I can tell you that I heard a lot of screaming and laughing from my bedroom upstairs as the kids were outside chasing each other with the balloons. Sometimes you just need to get some frustrations out, and hurtling water balloons at your sister might just do the trick. Our kids just need to be kids. They need us to get out of the way and let them BE. They need to have unstructured fun and time to discover. 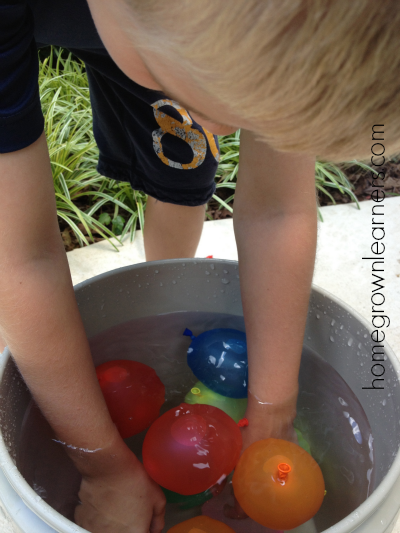 How about getting your kids some water balloons and sending them outside this summer? Better yet - why don't you go outside and throw some balloons with your kids? You're never too old for good old fashioned fun!